“Here comes the sun (tu-du-doo-doo), here comes the sun, and I say it’s all right…” as long as your kids are wearing proper sunblock protection. The ‘Fab Four’ had it right. The dawn of the summer season and all those rays of sunshine are cause for celebration. But before we get ‘sun drunk’ and run around without the right skin protection, let’s review a few chemical free, natural sunblock options for babies and children. First off, do not confuse sunscreen with sunblock. Most sunscreens with an SPF over 30 (anything less is pretty much useless), only protect your little one’s skin from UVB rays. The findings of a skin cancer study, released in 2007, showed that it is equally important to protect skin from the sun’s UVA rays. “Early on in sunscreen, no one really cared about it. They thought that UVB was the culprit,” says Dermatologist Darrell Rigel in an NPR interview. To ensure that your child is being protected from UVA rays, check the product label for the inclusion of avobenzone aka Parsol 1789 (an unnatural ingredient), or look for the term “broad-spectrum protection” on the packaging. Aside from the UVA/UVB protection issue, there is also the fact that sunscreens do not last long on the body. Most hold up for about 2 hours before breaking down, making it necessary to apply more lotion. The most straightforward thing to do in order to ensure that your child is safe, is to simply bypass sunscreen and stick with sunblock. Mainly made from zinc oxide, sunblock does just that – blocks the sun’s rays by creating a protective shield on the dermis of the body. Though it should be noted that some sunscreens now incorporate newer technologies that make them more akin to sunblocks. 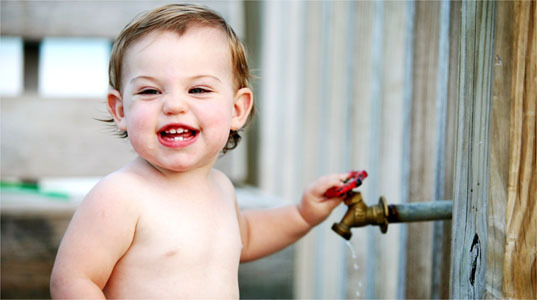 Neutrogena screens and blocks recommended for kids come in SPF 60 or higher grades. The ‘no chemical’ versions for sensitive skin types are SPF 30. Broad Spectrum UVA/UVB, Fragrance-free, PABA-free. $9.99 for a 4 oz. container at Walgreens. Same here. SPF 30 Chemical-Free Sunblock. Fragrance and Paraben Free Complete UVA & UVB Protection, Ideal for Sensitive Skin, No Mineral Oil, Petrolatum or Waxes, 100% Vegetarian. “Enriched with beta glucan, oat oil and lavender extract.” $15.99 for a 4 oz. container at DrugStore.com. “Our SPF  formulas are water resistant, safe for children of all ages, block both UVA and UVB rays.” Zinc Oxide, Extra Virgin Olive Oil, Golden Yellow Beeswax, Jojoba Oil, Cocoa Butter, Wild African Shea Butter, CO2 Extract of Seabuckthorn Berry, and Essential Oils of Lavender, Moroccan Blue Tansy, Ylang Ylang, Lime & Sweet Orange. $16.00 for a 2.6 oz. Container at BadgerBalm. 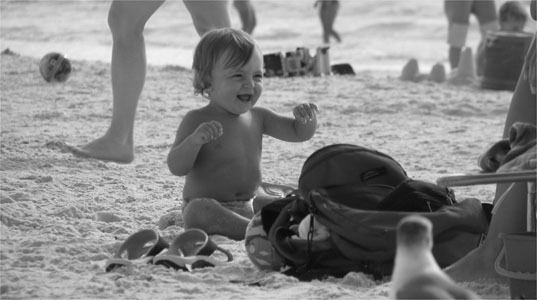 *Inhabitots Managing Editor, Beth Shea loves Badger sunscreen and uses it on her own babe and entire family. “Soléo Organics is environmentally friendly from its packaging to its contents. The contents of Soléo are 100% all natural and environmentally safe.” SPF 30, blocks UVA and UVB radiation with all natural ingredients including zinc oxide, herbal extracts and vegetable oils. $24.99 for a 2.9 oz. container at SoléoUSA. Keep sunburn and bug bites at bay with this smart option. SPF 30, UVA-UVB broad-spectrum protection, Citronella, lemongrass and cedar essential oils (does not sting eyes). “Perfect for the beach, hiking and swimming at the lake. Our PABA free, non-chemical formula helps to soothe bug bites and hydrate parched summer skin.” $19.99 for a 2.9oz container at CaliforniaBaby. Neutrogena Pure and Free Baby is what I'm using on my baby this year. It's nice to know there are safer products for babies these year. I would love it if Neutrogena would add a natural bug repellent to the formula too. The mosquitos are nasty this year. �Here comes the sun (tu-du-doo-doo), here comes the sun, and I say it's all right..." as long as your kids are wearing proper sunblock protection. The 'Fab Four' had it right. The dawn of the summer season and all those rays of sunshine are cause for celebration. But before we get �sun drunk� and run around without the right skin protection, let�s review a few chemical free, natural sunblock options for babies and children.